Located in the southern part of the United States, the state of Alabama is so-called after a native American tribe by the same name. The state is well-known for its landmarks dating back to the American Civil Rights Movement, beautiful landscape, and over 1,500 miles of inland waterways. 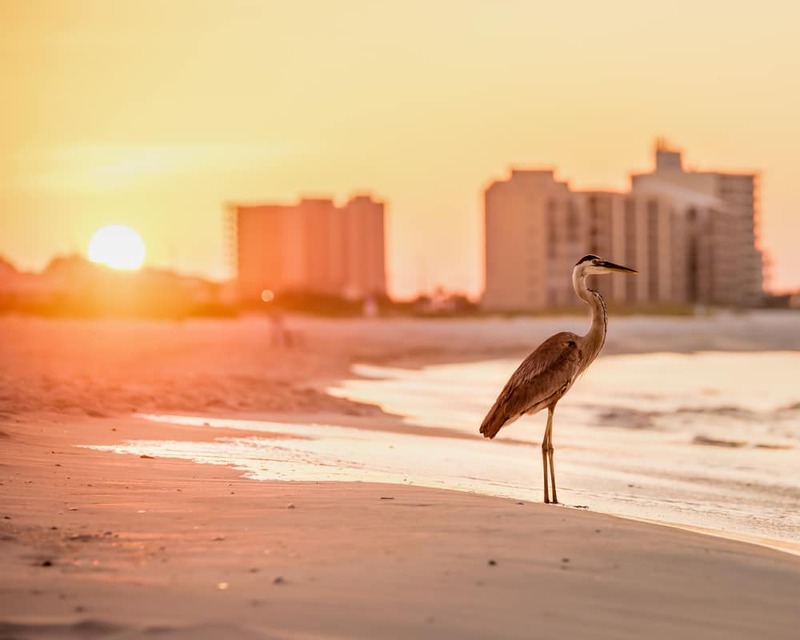 Also known as the Yellowhammer state because of the state bird, Alabama sees over 20 million tourists every year, of which most visitors come to the state for its amazing beaches located by the Gulf of Mexico. The state also has a rich variety of flora and fauna and is ranked among the best due to its biodiversity. English is the official language here while Spanish is regionally spoken. Let us now explore some of the amazing beaches of Alabama. Considered as Alabama’s best, West Beach extends from Fort Morgan peninsula to Mobile Bay and is separated by the Bay by Little Lagoon lake. Though most of the island’s shoreline is dotted with residential homes, the white sugary sand of West Beach is mostly open to the public. Though you can visit here anytime, May till October is the best time if you want some private beach time. There are several restaurants and luxury hotels along the coastline. The nearby Bon Secour National Wildlife Refuge is a great attraction for wildlife enthusiasts. Established in 1980, the refuge is home to sea turtles, the Alabama beach mouse, and various migrating birds. There are several trails around the Wildlife Refuge that stays open to the public throughout the year. 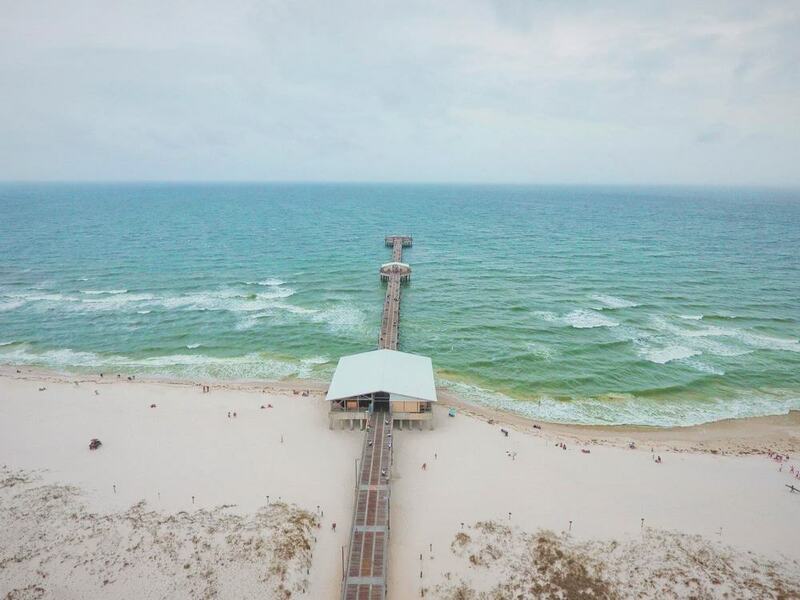 A highly famous beach destination for family goers, Orange Beach is an eight-mile-long stretch of white, sugary coastline and is a destination where everybody can find some sort of amusement to fill their heart with joy. Aside the many tourist facilities and services that the beach houses, the main attractions here are the various kinds of activities that it offers – either in the water or by the water. One of the most distinctive attractions here is flyboarding. Other popular sports and activities at Orange Beach include sunset dolphin cruise, sailing, and diving down to the state’s first deliberately-sunk ship wreckage. Fishing is another sport which is in high demand around the area. The common catches found in the waters at Orange beach consists of red snapper, marlin, and tuna. The adjoining Adventure Island Amusement Park and Arcade is a great place for children and their families to hang out. 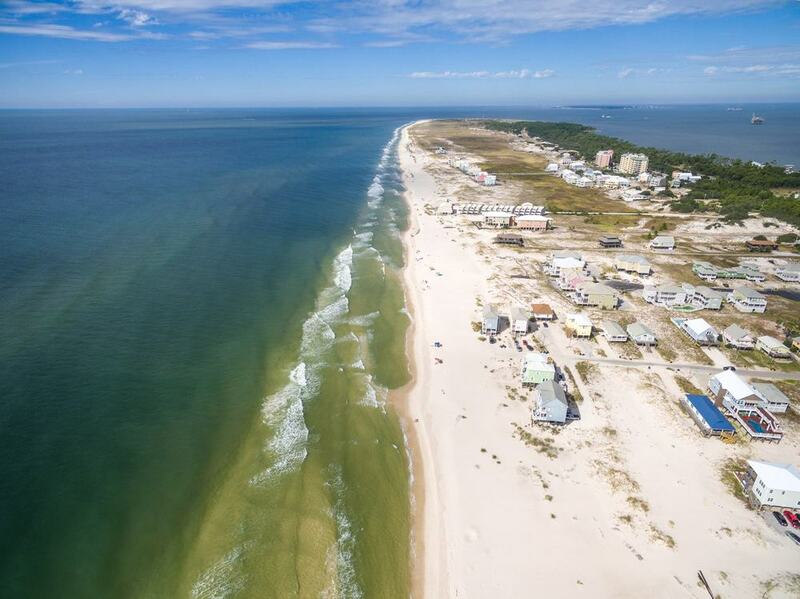 Pleated between Gulf Shores and Orange Beach is the 6,000-acre expanse of Gulf State Park which is known for its two-mile-long gorgeous beach and plethora of activities and facilities. The pavilion area by the beach is a relaxing spot and has a shaded picnic area and public restrooms. There are natural sand dunes and sea oats adorning the surroundings. Surf fishing is a popular sport here. You can also spend quality time exploring the Hugh S. Branyon Backcountry Trail on bike or foot. Alligators and deer are some of the wild animals that are easily spotted in the area. Recognized for its stunning natural landscapes, Dauphin Island Park and Beach in Mobile County is another beach gem in the state of Alabama. Though entry to the beach requires a nominal entrance fee (only in spring and summer), the visit is worth every penny. The area has a lot of varied panoramas and resources to explore and enjoy, some of which are its parks, trails, and exhibits. 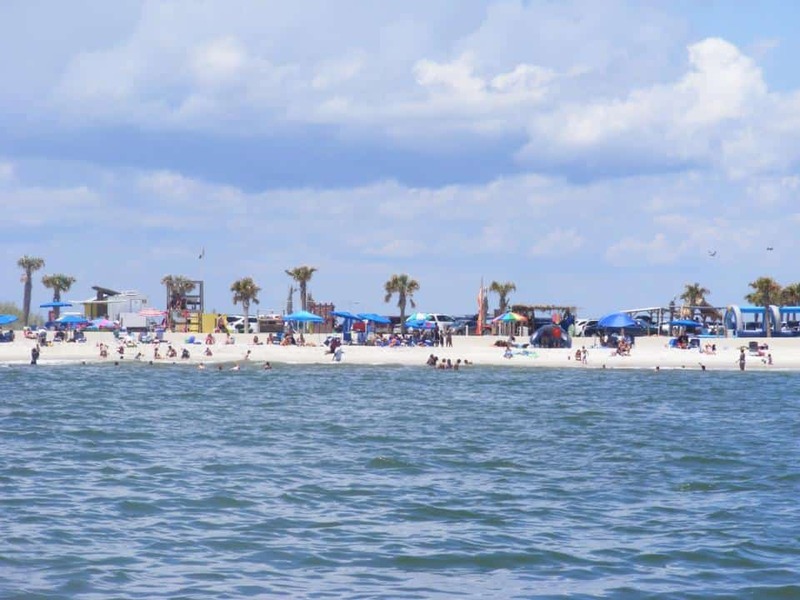 The only pet-friendly beach in the region, Dauphin Island Park and Beach is open throughout the year and offers camping facilities for RVs, trailers, and even buses. The camping ground around the Park allows for 151 sites, of which 99 are full hook-ups. Other facilities here include but aren’t limited to free Wi-Fi, free boat launch, 30/50 Amp service, picnic areas, dump station, a boardwalk that connects you to a secluded beach section, and a playground area. The momentous Fort Gaines is also worth a visit. The Fort Morgan peninsula is not only known for its pristine beachfront but also the history and luxury it offers to its visitors. The long-finger-shaped peninsula on the west of Gulf Shore is a perfect place to get away from the crowd and get close to serenity and nature. Though most of the headland is a section of Bon Secour National Wildlife Refuge, the beach at Fort Morgan is accessible to the public. A bit tricky to get to, the area is best explored if you stay at one of the beach hotels that offer you private access to the beach. If you are not a guest at any of the hotels around the coastline, there are only two access points to the beach. There aren’t any public facilities or stores around the area so you must carry everything you need. There are several beach houses and resorts for guests wishing to stay here. Another beach jewel located within the boundaries of Gulf State, Cotton Bayou Beach is the impeccable picture of an absolute beach holiday. Perfect white sands combined with rolling waves make the beach area highly popular among visitors. Located at the intersection of Highway 182 and 161, Cotton Bayou Beach is so well-admired not only because of the landscape and pleasantness it offers but also due to the presence of several public facilities and amenities which make the area very convenient for hassle-free relaxation. Some of the common amenities found here are restrooms, showers, lifeguards, and free parking. There are several restaurant and shops as well. The quintessential beach town of Alabama, Gulf Shores has everything you would hope for out of your beach vacation in the state. 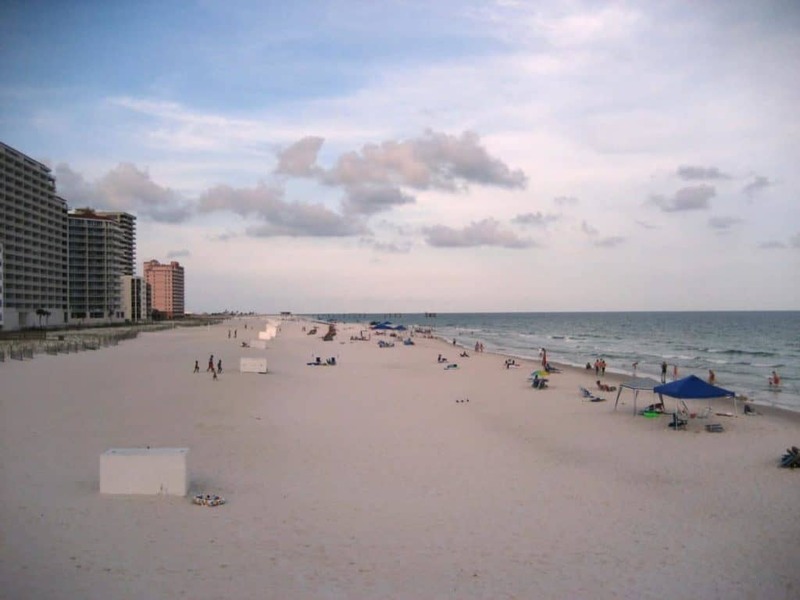 Though there are several beaches comprising the Gulf Shores, the Main Public Beach ranks very highly among them all. Some common facilities at the Gulf Shores Main Public Beach include open picnic pavilions, showers, restrooms, lifeguards, and free parking. You can also indulge in a game of volleyball at the beach. You can avail the all-day parking at the beach for a small fee. Located on the western end of Dauphin Island, West End Public Beach is a true example of beauty meets nature. 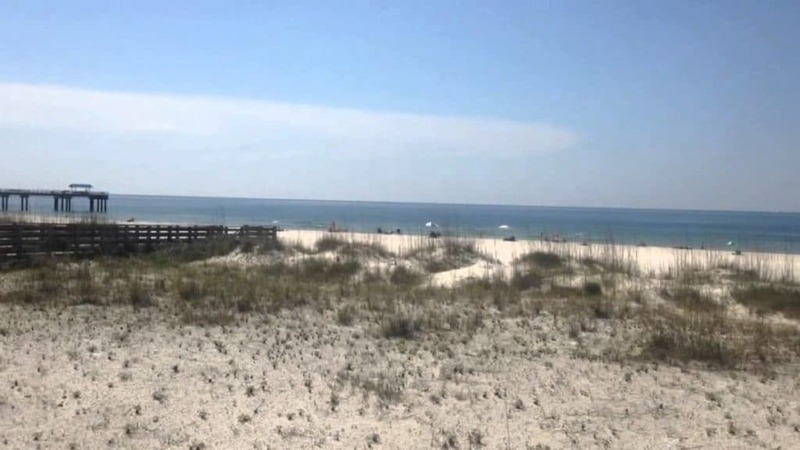 The beach has the same laid-back and relaxed ambiance as the rest of the beaches at Dauphin Island plus a lot of facilities for the public. Open seven days a week, morning till evening, West End Public Beach has strict policies against pets, littering, and overnight stays. The resident owners of the island with parking permits are free to park but the non-residents must pay a nominal fee for parking and entrance. Sugar white sands combined with parks dotted with ancient oaks and a public golf area makes West End Public Beach an amazing spot to relax. Other amenities at the beach include AC restrooms, showers, chair rentals, lifeguards, snacks and drinks vendors, a picnic area, and a water slide for children. Home to several illustrators and novelists, the artsy city of Fairhope, Alabama, offers some of the most picturesque views of Mobile Bay. 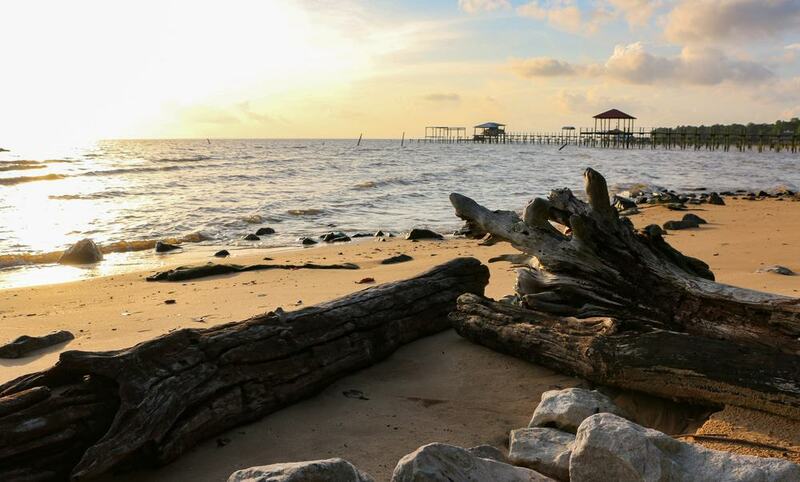 Located next to the Municipal Pier of Fairhope, the beach here offers the most spectacular sunsets in the region. The range of activities in the area includes swimming, snorkeling, and speed boating. If you are the type to enjoy a quiet beachside picnic, Fairhope is the place to be. The beach here has plenty of facilities and hence, is considered extremely family-friendly. Restaurants, boutiques, a popular rose garden, picnic tables, a duck pond and the striking boardwalk are some of the things you can find here. Spotting coastal birds such as pelicans is quite usual around the pier. Nestled in the town of Orange Beach, Florida Point Beach is a mile-long beach that is located east of the Perdido Pass. In fact, the Pass separates Florida Point from the Alabama Point and is at the mouth of the river by the same name. A part of the Gulf State Park, Florida Point is mentioned in the Alabama Coastal Birding Trail. Beach parking at Florida Point is free for all and there are several public facilities in the area, some of which are restrooms, showers, boardwalks, and shaded picnic areas. Surfing is possible on the western side of Perdido Pass. Florida Point Beach is a little out of the location as compared to the prominent Cotton Bayou Beach which makes the former rather calm and less-crowded, a plus for those who want some privacy and peace. Among the many scenic beaches of the Gulf State Park lies Romar beach, not so popular yet supremely stunning. Located a few miles east of Highway 59, Romar Beach is a quaint area which is most idyllic for beach strolls and picnics. There are a few resorts and condominiums around but most of the area is untouched which also explains the lack of public facilities in the area. Though there are plans to establish a few amenities in the region, as of now there is only free parking and restrooms available. 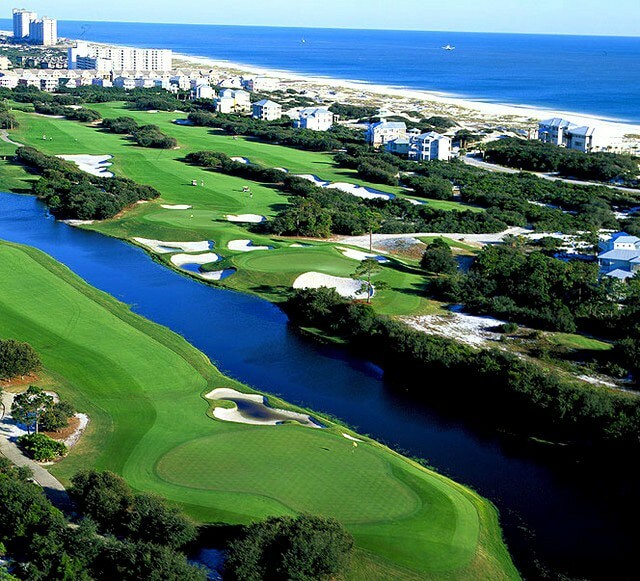 Located in Gulf Shores, Alabama, Kiva Dunes Resort and Golf is a beachside holiday resort which offers its guests with all the luxuries that one can hope for. The resort derived its name from a native American word which means a shelter for retreat and rejuvenation. With its mile-long sugar white private beach, Kiva is one of the top choices for luxury holidaymakers. Surrounded by magnificent turquoise blue waters and rolling dunes, the private beach at Kiva offers access to several nearby attractions within the resort. Whether you want to dip your toes in the sand and unwind in your beach chair while you lose yourself amidst the sound of waves crashing on the shore or you wish to get a bit more active and enjoy a game of golf or tennis, Kiva has it all. You could also enjoy a soothing massage at the in-house massage center, watch the sun go down as you balance your mind, body, soul with yoga, or relish a hearty meal with your beloved at the beachside restaurant.